U Is For… Understanding! – with Guest, Grace Kahlo! Please help me welcome Grace Kahlo, one of the newest members of the Writer’s Retreat. Grace, take it away! Have you ever had this moment when you don’t understand what the heck your characters are doing? I’m a Plotster. That means I just write and do the plotting along the way, after I finish writing, or something general before I start writing. There always comes this stage in the story, usually at the beginning of the middle, when I don’t understand my characters. Some writers would say: well, do a character sketch, do an interview with the character. With all due respect to all the brilliant plotters out there, this method isn’t for me. Moreover, it sometimes confuses me, takes time away from drafting, and I end up with lots of notes and nothing to show for it. I keep writing, and get back to the problematic parts later. Usually, the more I draft, the clearer the story and the characters become in my mind. It does make for some frustrating writing at times. But, that’s what works for me and we all need to find our way of writing. I try to remind myself that every time I write—no matter if it’ll end up in my manuscript, no matter if it’s for publication purposes or for fun—I’m living my dream. I’m writing. I’m editing. I’m living it now. The now is what’s important, because who knows what the future holds in store for us. And, that’s what I tell myself when my characters are throwing a tantrum. Then I dig deeper, switch point of view, change an aspect of the story, write more about the history of the character. Until, at last, things click together and the story moves forward. How about you? How do you go about understanding your characters? This entry was posted in Blog and tagged #atozchallenge, Characterization, Grace Kahlo, Writer Zen Garden, Writing. Bookmark the permalink. Grace, the idea of characters throwing a tantrum made me smile, because that's exactly what it feels like to me, too. I love your post! The sense of hope, and the "keep going" advice, is spot-on. Thanks! So very true- great advice ! Beautifully said. I'm finding that my skill seems to lie more in the area of short stories than novels. Yet I'm still plodding away toward 50,000 words on the Camp NaNoWriMo challenge. ~grin~ Folks can find me at http://darlamsands.blogspot.com/, which is number 1209 on the A to Z list today. 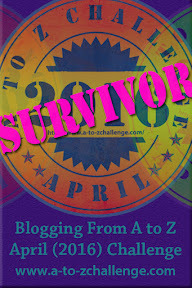 Happy I found your blog to follow before the #Challenge is over. This post is a good example of why I'm along for the ride. In my first novel, the vicar's wife went off to the pub in Burford and wore no bra. She certainly startled me, having her way like that. Things happen! I wish I could plot methodically, but can't manage it. Love these good tips for next time. Thanks, Stephany! We're glad you're here.